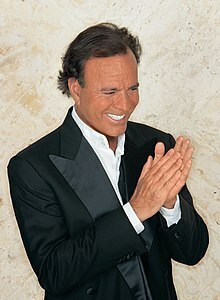 Julio Iglesias in November 2007. Julio José Iglesias de la Cueva (born 23 September 1943) is a Spanish singer-songwriter who has sold over 300 million records worldwide. According to Sony Music Entertainment, he is the best selling Latin music artist in history. He is also one of the world's best-selling artists of all time. This page was last changed on 2 January 2015, at 00:00.